The open floor plan kitchens are fully equipped and include the finest appliances from Wolf and Sub Zero. Custom alder cabinets and granite counters make a rich environment to inspire the creativity of any chef. 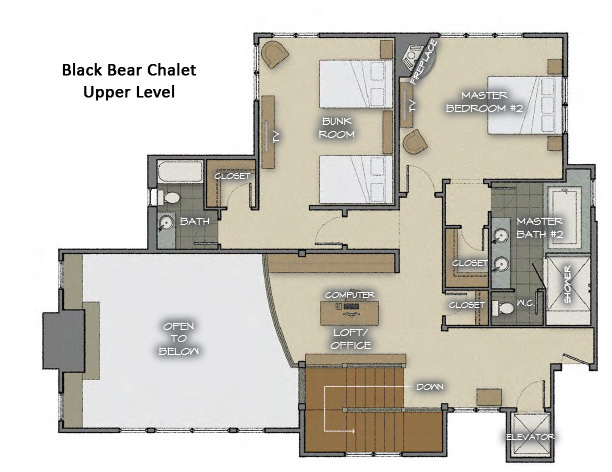 The Bear Grande Chalet offers 8 spacious bedrooms each with en-suite bathroom. 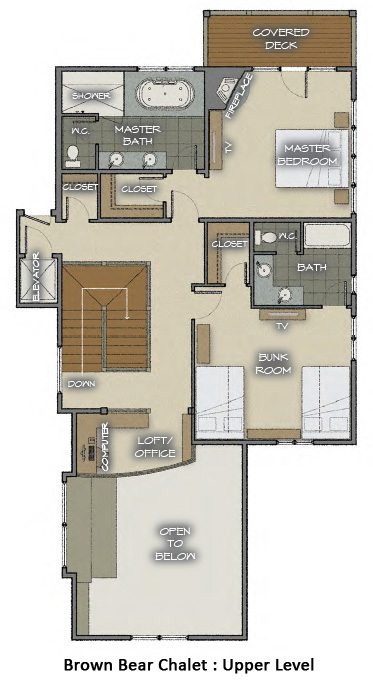 You'll find two Master bedrooms and two Bunk rooms on the upper level; two Guest Master bedrooms and two Junior Master bedrooms are on the main level. The two recreation rooms on the lower levels offer media and games areas with a 50" big screen TV with surround sound, PS2 video games, and a pool table. The separate mud room includes a boot dryer and storage cupboards for all your ski equipment. 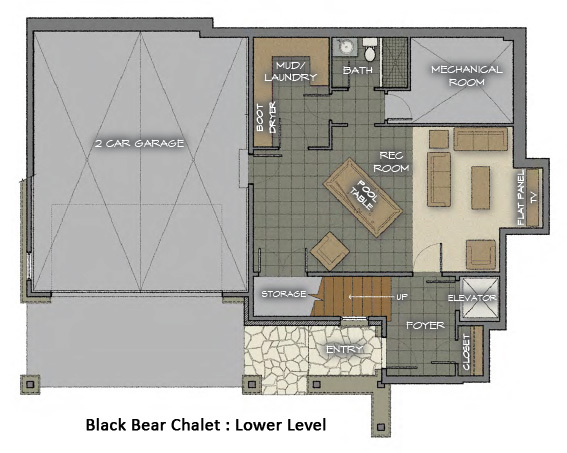 The two chalets are each equipped with an elevator serving all floors. Ski access is a breeze as private shuttle service will bring you to the Thunderhead Express Chairlift in just one minute. 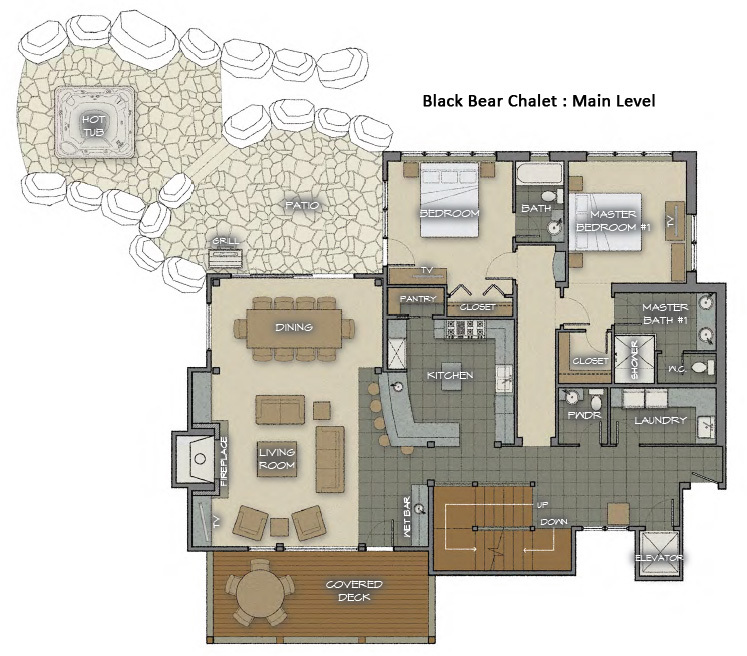 Bears Grande/Moving Mountain's is truly everything you look for in a vacation rental and concierge company. They exceeded my expectations on every level. Heather, Jenny, Renee, Nick, Matt, Sasha and the staff could not have been more accommodating! Can't wait until next year!! Bear Lodge is fantastic for large groups! My family rented both lodges for a week. We were a group of 21 including babies. There was ample space for all of us. The lodges are beautifully furnished and equipped with everything you need especially if you want to self cater. We also loved the hot tubs and bbqs! The lodge is located down the road from Thunderhead Lift so a shuttle is required. However Moving Mountains provided an excellent shuttle service. The staff were always punctual and friendly. We enjoyed a fantastic week in Steamboat. Thanks Moving Mountains! Very Centrally located for the whole extended family. Close to the slopes, shops and town centre. Every amenity that we could possibly ask for (and more). Spacious, warm, beautifully furnished and wonderful hot tubs to relax in. A wonderful place to gather family and friends. I’ve planned two trips to Steamboat Springs within the past three years. Both trips I’ve used Moving Mountains, I could not be more pleased with the properties and their customer service. Our family of 13 enjoyed Falconhead Lodge the first time in January, 2013 so much that a return trip was planned for Thanksgiving, 2015. 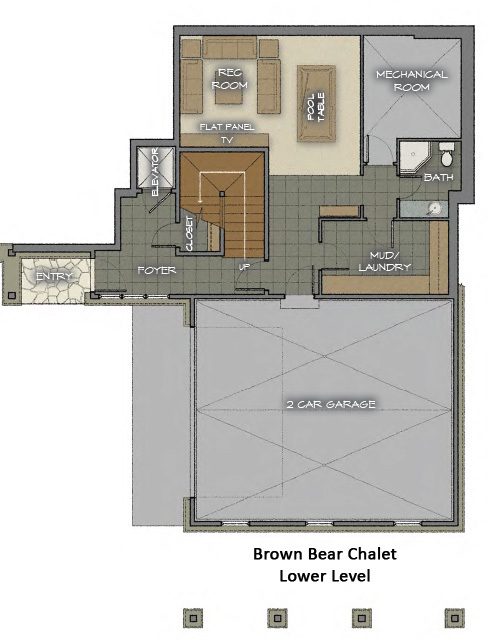 Our family grew in the meantime and had outgrown Falconhead(on one side but not large enough for both units).I decided on Bear Grande for all the space and privacy for each couple as well as the bunk rooms for the children. Erin and Britt with Moving Mountains were so helpful and I probably drove them a little crazy during planning with my excitement. They joined us for dinner one night and we were able to get to know them on a more personal basis. Such great young ladies! We also enjoyed Mr. Maintenance… Ron… he drove us around the first full day we arrived and shared his cell number in case we had any problems with anything in the house. Patrick and John were our shuttle drivers the rest of the week and Victoria and her team came out for the mid-week clean. I’m not sure who does the hiring or training at Moving Mountains but they are all unbelievable. It’s all about customer service and all of these people gave us their “all” during the week we visited Steamboat. We had our lift ticket passes all ready to go thanks to Erin and Britt as well as a team effort for private ski lessons with Allie, Eric and Sasha as instructors! Thank you Moving Mountains for welcoming us back to Steamboat. We loved our home away from home. We recently stayed at the Bear Chalets(combined) for our family reunion in Steamboat Springs. This property and those we dealt with at Moving Mountains were fantastic! The home was very comfortable for our large group, and the staff kept the grounds and the house in great shape while we were there. The location was great, just above the mountain village and not far from downtown. Everyone in the family commented on how comfortable they were and that they were so amazed how well the house was equipped to handle a large group. We will definitely stay with Moving Mountains and the Bear Chalets again. Thanks for a great time.